IPv6 stands for Internet Protocol version 6. IPv6 is the latest version of the network-layer protocol for packet-switched networks. The version that is generally used is IPv4. 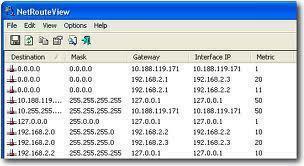 One of the reasons for the upgrade to IPv6 is that it allows greater space and flexibility in assigning IP addresses. For instance, IPv4 is based on a 32-bit address system that limits the number of possible unique addresses to 4,294,967,296. In a few years, the number of available unique addresses will decrease. IPv6 solves this problem by making the number of possible unique addresses practically infinite. It is said that IPv6 offers every star in the known universe 252 unique addresses! Since the Windows Vista version, IPv6 protocol is enabled by default. 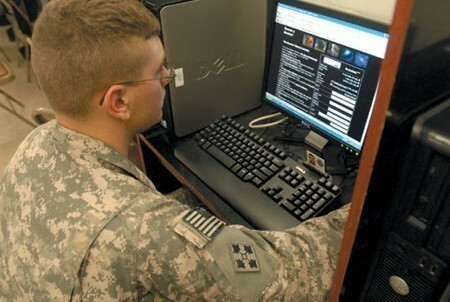 If you are not using it, you can freely disable it without consequences to your system or Internet performance. 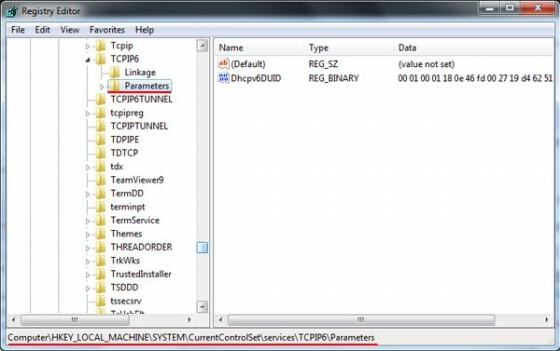 Process of disabling the IPv6 is same in Windows Vista and Windows 7. 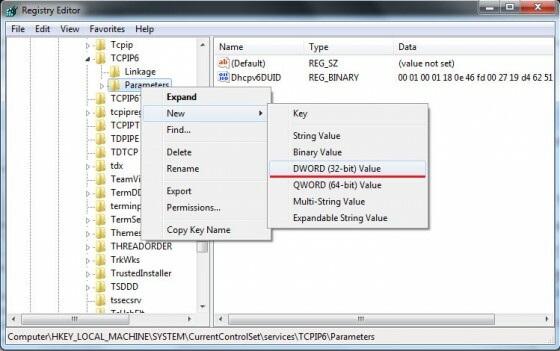 You can easily disable it by unchecking IPv6 option in Local Area Network Properties, but after you restart your computer, it will be checked again. 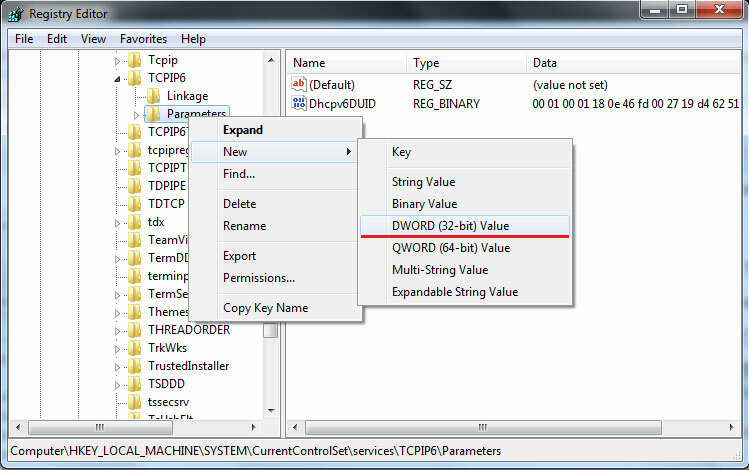 In order to disable this protocol permanently we need to work with registry editor. 1. Open registry editor by clicking the Start button, and then “Run”. 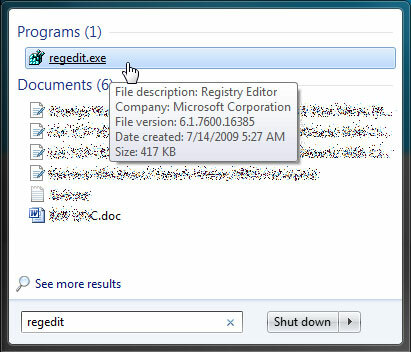 Then type the “regedit” without quotes and press “enter” on you keyboard. 2. Navigate to the HKEY_LOCAL_MACHINE -> SYSTEM -> CurrentControlSet -> services -> TCPIP6 -> Parameters. 4. Under Value name write: DisabledComponents. 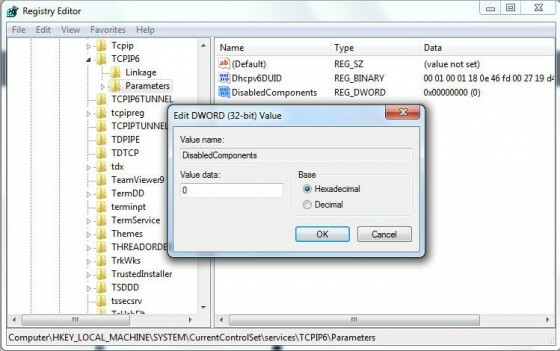 Then double click on the Disabled Components you created and enter FFFFFFFF. 5. Click OK, close everything and restart your computer. This method will disable IPv6 from your LAN interfaces, connections, and tunnel interfaces, but will not disable it from the IPv6 loopback interface. It should also be noted that once you disable IPv6, you will not be able to use specific applications such as Windows Meeting Space or any application that requires the Windows peer-to-peer networking platform. 212 queries in 0.364 seconds.